Have I Shown You My Chondrophore Collection? 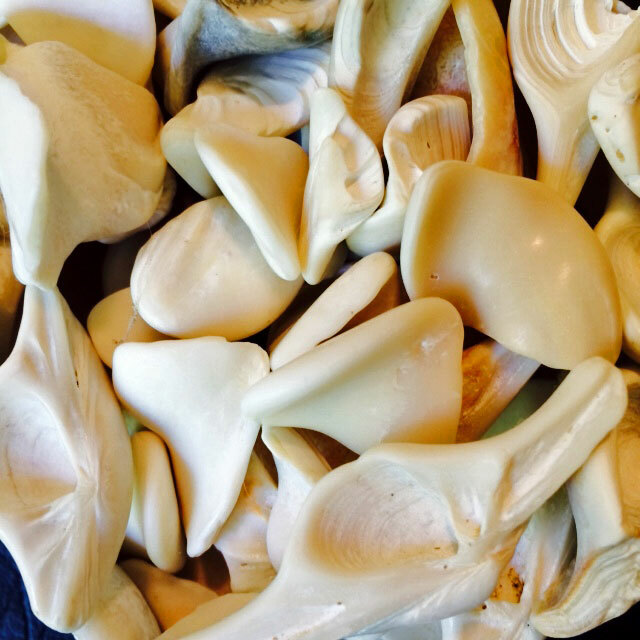 Did you know beach combers collect sand-polished clam condrophores? Chondrophores are internal spoon- or tooth-shaped projections of the shell in some bivalves. Gaper clams (Tresus) are known for their large attractive spoon-shaped chondrophores. A point of attachment for the internal ligament in live gapers, we seek them out on sandy beaches, long after their usefulness as origins and insertions has ended. I bragged about my collection back in July, 2014, when I had only a few- accumulated absentmindedly over the years because their pleasing look and feel was irresistible. Since I wrote Getting to Know Gapers, I’ve kept my eyes open for prime chondrophores, and I now boast a collection that overflows a large upturned red abalone shell. If you know Haliotis rufescens, you know that’s a lot of chodrophores. Here’s what we’re looking for. 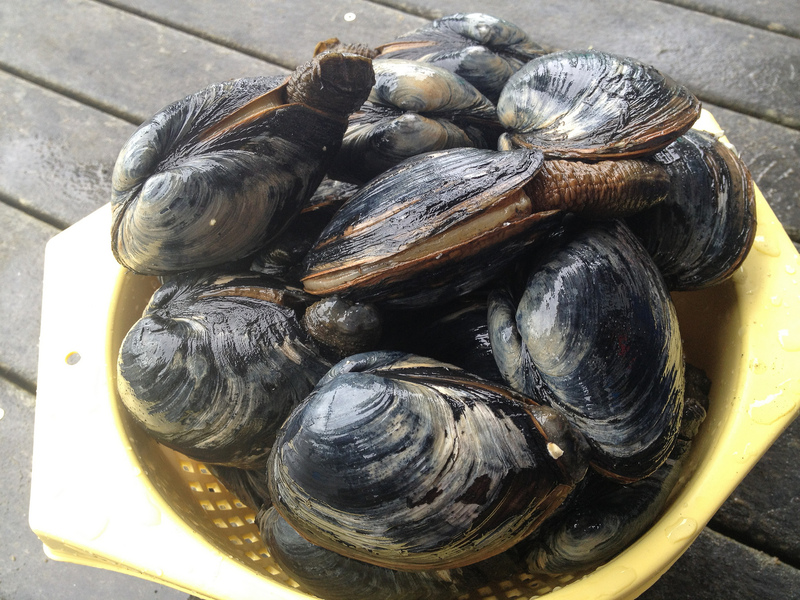 In Oregon, most of us think of gapers as estuary clams and harvesting them there at low tide is a cherished pastime. Here’s a colander full of handsome fat gapers, Tresus capax, showing what the outside of the shell looks like in life. One way or another, empty gaper shells wind up on the surf-swept beaches of the outer coast where erosive forces sculpt and polish them until all that remain are chondrophores, the most resistant part of the shell. You can get a feeling for the progression from the collection of photos below. Some of the chondrophores in the image above show annuli or growth rings which can be used to age gapers. Older gaper clams are well over twenty years old. If you want to try ageing gapers yourself, here is the definitive protocol. Just about everything else you might want to know about Oregon’s gaper clams, including why they’re called gapers, can be found here. 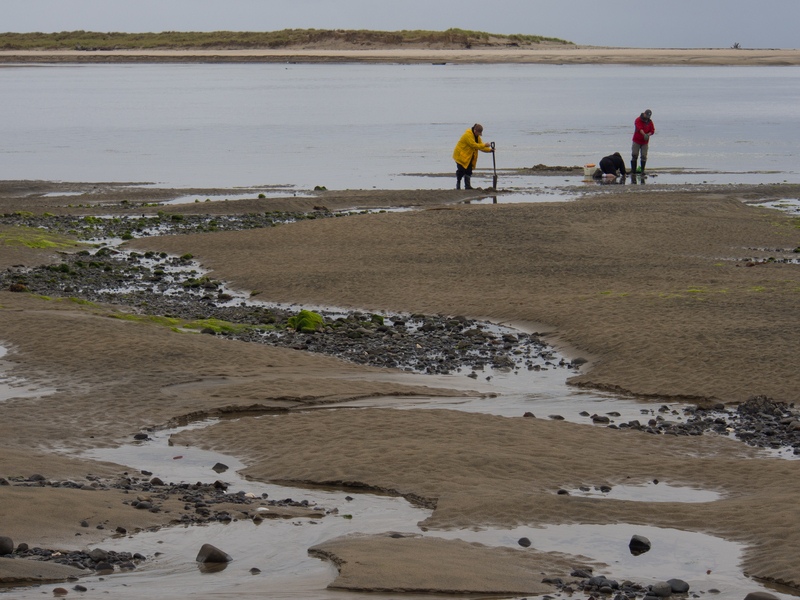 Dolan Halbrook’s photos illustrating gaper clam digging in the estuary, and recently harvested live clams improved the breadth of this post. I thank him for sharing “clamdiggers” and “ready for the pot”. Harbo, R. M. 1997. Shells and Shellfish of the Pacific Northwest: A Field Guide. 3rd Printing, 2007. Harbour Publishing Co.
Those smoothed chondrophores are beautiful. Isaac, They sure are. The diversity of shapes must be nearly infinite. Guess it’s dependent on chance and how long they’ve been polished by surf and sand. I have a few favorites for sure! Just clicked into this old post….. i could get into those chondrophores! We get lots of what we call otter shells here, they have a large chondrophore, but the shell is fragile. I shall be in the look out now. I’ve found a few nice looking chondrophores from other species on the Oregon coast, California mussels, for example, but most other species here have small or no chondrophores, or they are too fragile to form a nice spoon-shaped remnant. Good luck searching your coast! I enjoy your blog.